Not all fitness centers are created equal. Use this checklist to make sure a fitness center has all the features that make it a pleasure to keep up your workout routine. Cardio workouts are essential for everyone, whether you want to lose weight or stay in shape. Stationary bikes, elliptical trainers and treadmills are all great ways to get your heart and blood pumping. Make sure there are multiple machines so you're not constantly waiting to use one. Weight training complements cardio for a well-rounded workout. Either free weights or weight machines provide the equipment you need to build strength and tone muscles. No one wants to work out in a facility that's dirty and smells like a locker room. In addition, germs can be a health hazard if the fitness center isn't cleaned on a regular basis. Take note of the overall appearance as well as the cleanliness of equipment, mirrors, windows and other specific areas. The best fitness center isn't much use if the equipment is always out of order. Check the machines to see if they're all working and ask if there is a maintenance team to handle repairs. Is the center accessible to the general public or exclusive to residents? Is a card or passcode required for entry? You should be able to feel safe and secure when using the facility. 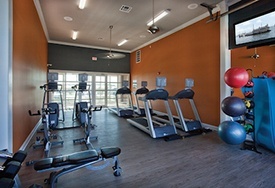 One of the benefits of an on-site fitness center is the freedom to work out on your own schedule. Round-the-clock access is preferable, but if there are specific hours, make sure they're compatible with your needs. The 24/7 fitness centers at our Springs communities check all these boxes and more, including yoga and Pilates areas to accommodate contemporary workout styles. Get more information from the helpful members of our Springs leasing teams.